Kids at the age of one year already require regular brushing regardless of their number. Brush teeth one year old baby is not yet possible, so parents will have to help. Let the kid starts the procedure himself, and to finish it will be the adults. Select a toothbrush.Clean only prorezalsya teeth whether with a special fingertip that is worn on the finger of an adult and has elastic bristles made of silicone. Buying customized baby toothbrush, pay attention to the following features:- the bristles should be soft, made of synthetic materials. The outline should be neat, tightly trimmed and not extend beyond the edges of the plastic head. - the location of the bristles is preferable to choose a brush with bristles of different lengths, located at different angles. - brush head should be rounded. Pick the right toothpaste.Choose hypoallergenic formulations designed for children from one year. Begin brushing the teeth.First time brushing teeth baby yourself, show how to handle the oral cavity. First, just wet the toothbrush with water and drag it across the teeth. Let your child use a toothbrush.If the child shows interest, allow him to brush his teeth independently. Direct the movements of his hands, showing how to handle a brush. 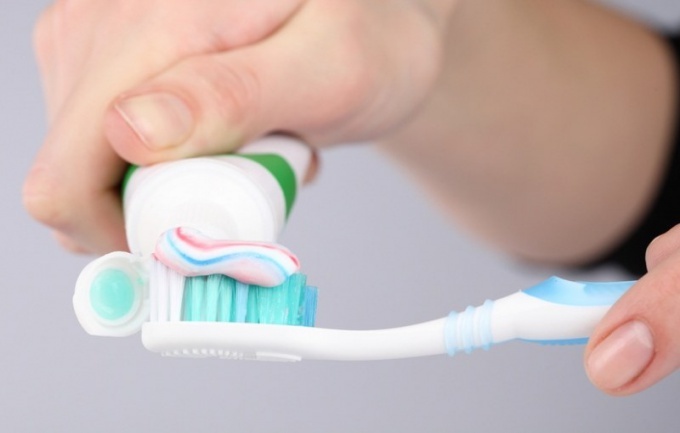 Squeeze toothpaste on the brush themselves, as the child is not yet able to calculate the amount of paste. Teach your child to spit the toothpaste.A toothpaste for children can swallow, but to teach the child to spit the paste necessary. Show by example how to rinse your mouth and spit the water. The child learns immediately, but gradually mastered the necessary skills. 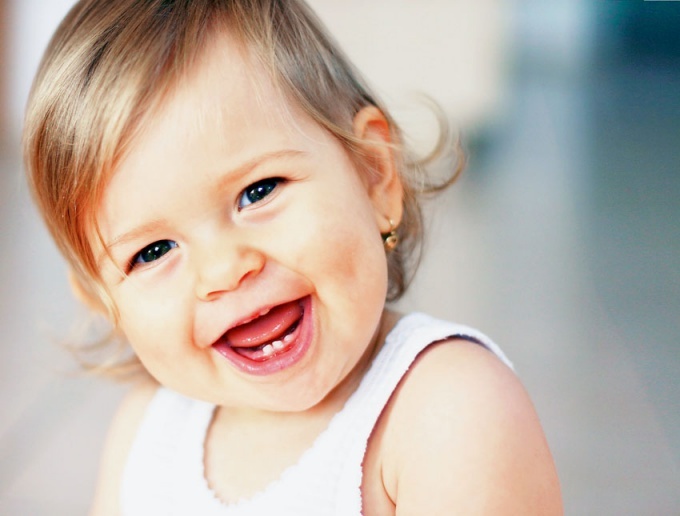 If the baby does not want to use a brush.Brushing teeth one year old child can be a fingertip. The device effectively to remove plaque, food particles stuck between the teeth. You can use a piece of gauze or bandage wrapped around a finger and moistened in salt solution. Proper and regular care helps to maintain the health and beauty of your teeth. You need to teach the child to this procedure as early as possible. After all, even the dairy teeth need daily cleansing. Serve the child a personal example. Before forcing the kid to pick up a toothbrush, encourage him. Take it with you into the bathroom every time you want to brush my teeth. The child must realize that it is a natural daily habit. It would be better if you lead by example will be the adult that kid more listens and who tries to emulate. Help your child the first time to brush my teeth. He must do everything himself, you just guide his hand. It is important to organize it as an independent process hygiene. Was interesting to the child, buy beautiful toothbrush safe toothpaste with a pleasant taste. If the child is in the age of reason, allow him to choose a brush, Cup and toys that can be taken to the bathroom. The idea that all these accessories he bought himself, will strengthen the baby the desire to clean teeth. Brushing teeth doll or favorite toy. Let the baby tries and learns from you. During the game tell the story of the teeth or sing a song. Try available for the child to explain to him the benefits and necessity of dental care. Draw informative poster and hang it in the bathroom - it will strengthen the children's interest. Make cleaning as easy as possible for the child. Place a small chair to the sink, the baby was looking at myself in the mirror and could easily reach the faucet. When the child finishes brushing his teeth, give him a chance to admire it and compliment it. Treat patient with the failures of the child. You need at least a month to aggressively monitor the baby. Do not scold him for mistakes, otherwise, instead of the natural habits you will get the reluctance to clean teeth for many years. Remember, that your child reflects your actions and behavior, so it is very important your attitude to what you learn.